Howlite. Synonyms: kaulite, calcite-boron-silicon. We turn the special attention on it natural mineral, which today often give out for turquoise. Color of natural howlite usually white or grey, often there are minerals with brown and black veins (these veins are reminded by the veins of turquoise). A mineral is adopted in honour his discoverer - Canadian geologist Henry Gove. A howlite is the borosilicate of calcium of Ca2B5Si09(0H) 5. It is cheap material. In the ultraviolet light tiny, the barely noticeable with a naked eye crystals of howlite sometimes shine rather yellow or whitish light (these crystals also can be looked over in strong magnifying glass). 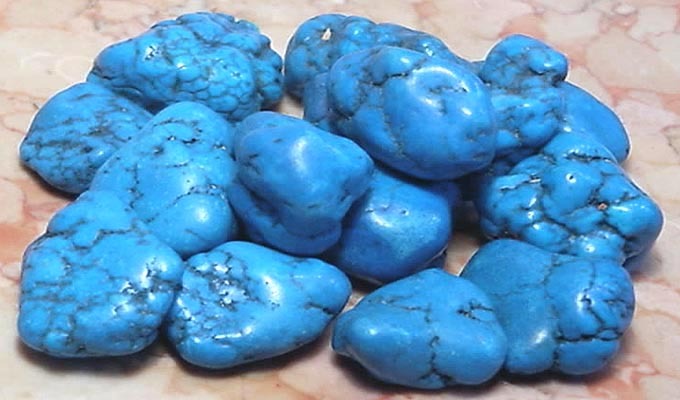 A howlite is easily dyed in dark blue, turquoise, green and any other tones and very often comes forward as a substitute of turquoise, and also red or rose corals. It natural mineral. An imitation turns out so exact, that salespeople consciously give out the painted howlite for the real turquoise. From a howlite cut beads, cabochons and even small figurines. Polished surface of howlite of flash, as if porcelain (another difference from turquoise). Main mine deposits are located in New Scotland (Canada). There is a howlite and on territory of California (USA). Turkvenit is a variety of howlite. The superficial painting over of howlite is very quickly worn down. Therefore we recommend to acquire inexpensive decorations as beads and pendants from the unpainted over unennobled white howlite (caulite), because at his carrying the commodity type of good will not be lost. In beads he will a bit remind white turquoise and intrigue circumferential, saving the interesting picture of veins and cracks and all of dignities of natural stone. Achroos howlite on sale be found not often. The white color of howlite is symbolized by innocence and at the same time personifies force of human dignity. Decorations with a howlite will help to pacify anger, drive away anxious ideas and emotions. There is a popular belief, that a howlite is brought by quiet sleep and helps to remember past sleeps. This mineral intensifies sense of wonderful.